Read / print the article as a PDF file here. F&H Manufacturing is a family-owned machining company located in Jackson, Michigan. The company utilizes automatic screw machines, CNC lathes, and machining centers to provide high quality custom parts to a variety of customers. Founded in 1987, F&H Manufacturing began with the purchase of two automatic screw machines. Today, some 32 years later, the company boasts 23 automatic screw machines, 10 CNC lathes, 9 machining centers, and a secondary department to allow for the in-house finishing of parts. 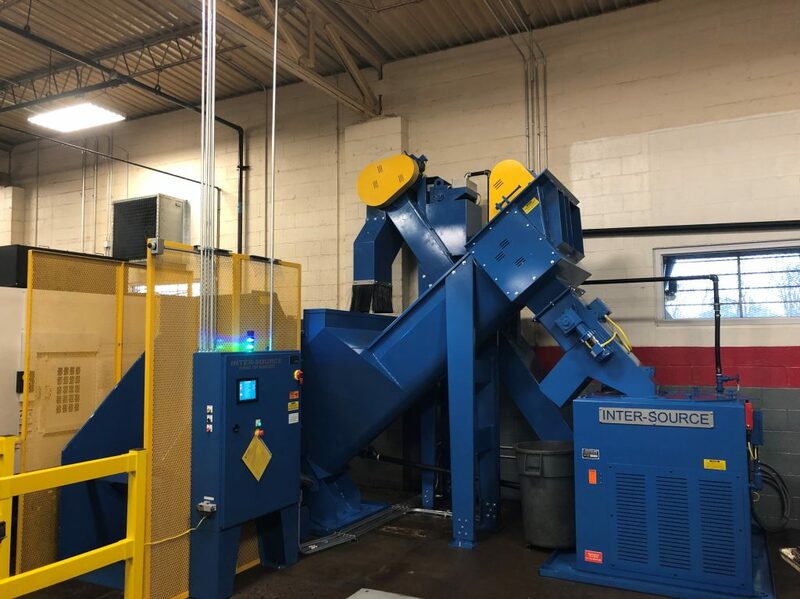 20 years after the original chip processing equipment was installed, Scott Kellenberger and F&H Manufacturing knew it was time for a change, so he called Inter-Source. The chips were not worth maximum value from the company’s scrap dealer, causing F&H to lose out on thousands of dollars. F&H Manufacturing knew that they had to make a change. Scott Kellenberger received proposals from Inter-Source and another supplier. At the end of the day, Inter-Source was awarded F&H’s business and more importantly, was awarded a relationship with the family-owned business. 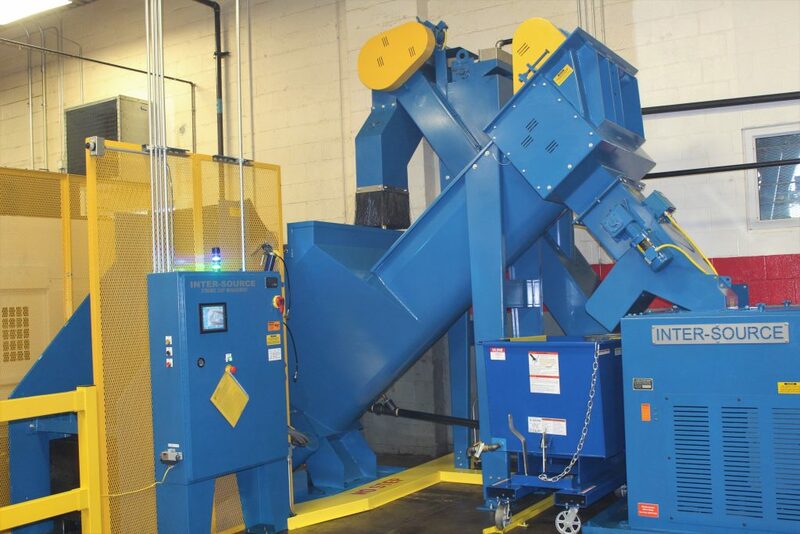 “We wanted a strategic partner, not just a scrap equipment supplier” said Kellenberger. “With the other suppliers, it felt like they were just going to drop off the equipment and we’d never hear from them again” Kellenberger added. Next came the Wringer’s feeding system. To ensure Scott’s peace of mind, a Hydraulic Cart-Dumper and safety cage was installed. 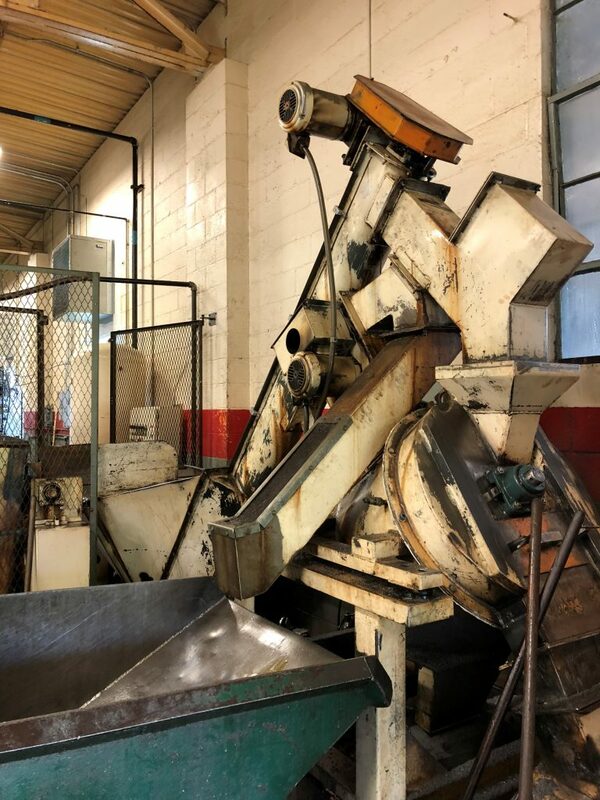 A 16” Incline Screw Conveyer complete with a Parts-Separator for solid removal was the ideal piece of equipment to feed the Wringer for F&H. Stringy chips are no longer an issue for F&H as a powerful Inter-Source Chip Shredder was also included on the system. To ensure the stringy chips are being fed to the Shredder, a bridge breaker screw was installed. Finally, after the chips are dried to 2% moisture content or less, they are pneumatically transferred (no air compressor required) by the Chip Wringer to the Automatic Mechanical Swivel Chute for discharge. A photo sensor monitors the chip output accurately and rotates the Swivel Chute when necessary, ensuring the chip container is filled evenly with every load. 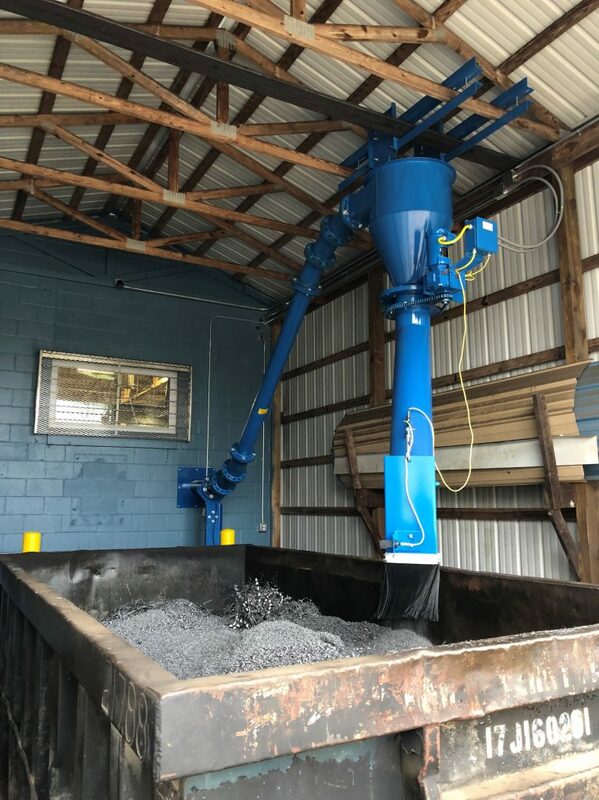 A Drag Conveyor and primary filter system work in harmony to ensure the maximum amount of cutting oil can be reclaimed. Finally, a Magnetic Oil Filtration system was incorporated by Inter-Source. 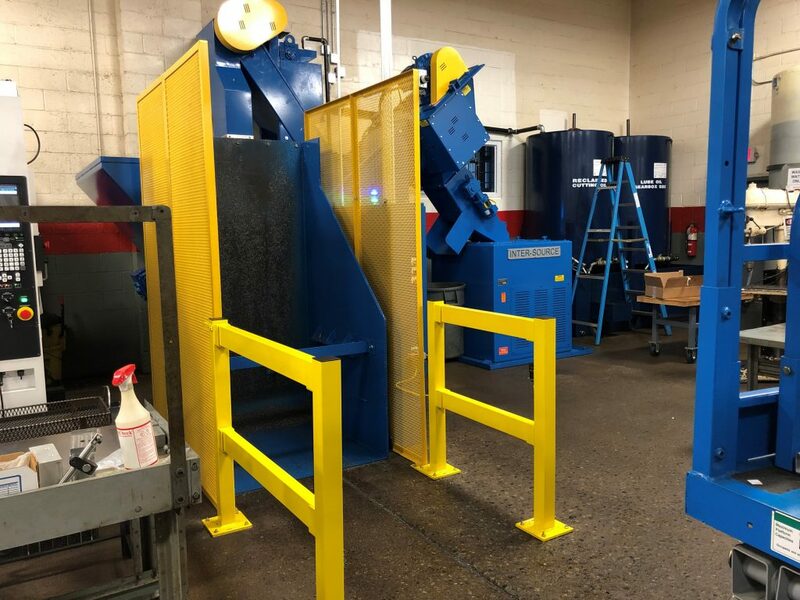 The installation of the equipment was a complete team effort, as F&H Manufacturing along with Inter-Source technicians were able to combine forces and have the system up and running in less than 2 days. Minimal down time was very important to F&H during installation. “For us, if we’re not running chips, our production is backed up. We’re losing money!” Said Scott Kellenberger of F&H. “(Inter-Source) had everything measured to the last quarter inch. Your team was there start-to-finish, and was very thorough during the installation. I am very impressed with how well everything went, from the drawing board to spinning chips” said Kellenberger. At Inter-Source, we pride ourselves on the relationships we are able to build with hard-working customers like F&H Manufacturing. Top to bottom, F&H has been a pleasure to work with and we look forward to another long-term relationship. For a summary of the equipment installed at F&H Manufacturing, please see below. To find out how Inter-Source can improve your operation, please call 1-269-375-5100 or send an email to: mail@inter-source.com. Inter-Source, founded in September of 1984, was incorporated in Michigan in 1985. To date, Inter-Source has engineered and installed over 600 systems in countries around the globe. The industry leader in innovation, Inter-Source perpetually engineers advancements to improve your bottom line. Inter-Source holds nearly three dozen patents in multiple countries, representing the industry’s most important advancements. These advancements are part of the reason that only Inter-Source can guarantee a retained moisture content of 2% or less on processed chips. Inter-Source Recovery Systems is headquartered in Kalamazoo, Michigan. Since 1985, Inter-Source has installed over 600 Chip Systems in 7 countries.